You can find the sample project on my Github page: Add Facebook-Login to Ionic App using Firebase. Before we could start we do a short recap. For this tutorial we’re going to use an existing Ionic project which uses Firebase already. The project we’re going to use was created in the Ionic and Firebase Authentication tutorial which I’ve created earlier this year. If you haven’t these things already done, you can download the starting project from Github. Before we can start implementing the Facebook provider into our app, we need to create a new Facebook App. To create a new Facebook App you should be registered with your Facebook Account as a developer and switching to the Facebook Developer Portal. If you’re logged in, select “Add a new App”. In the security popup you need to resolve the captcha and it creates your app. 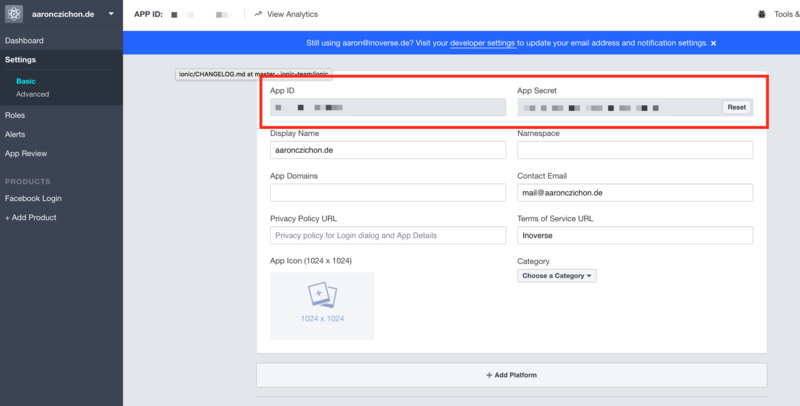 If your app was created and Facebook redirected you to your app, you have to select “Facebook Login” to add the login functionality to your app. Now you need to switch to your Firebase console, into our project and add Facebook as an authentication provider. After entering the App ID and the App secret you need to copy the Firebase redirect URL and hit save. The redirect URL from Firebase should now be entered into your Facebook app. 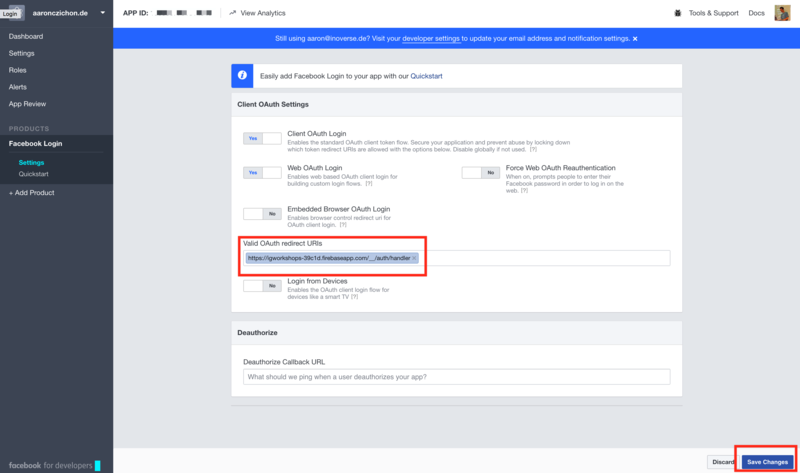 So switch back to the Facebook Developer Portal, click on Facebook Login under Products and enter the redirect URL into the Valid OAuth redirect URIs field. After this hit Save Changes. Also we need to add this redirect URL to the Facebook app platform. For this, select Quickstart on the left side menu and select Web as platform. Enter your redirect URL and hit Save. Now your Facebook app is nearly finished. We come back to that later. There are now two main ways we have to implement for using Facebook login. First, we implement the option to login using Facebook if our app is running in the browser. Second, implementing the usage of the Cordova plugin to use Facebook login on mobile devices. So let’s start with the web version. 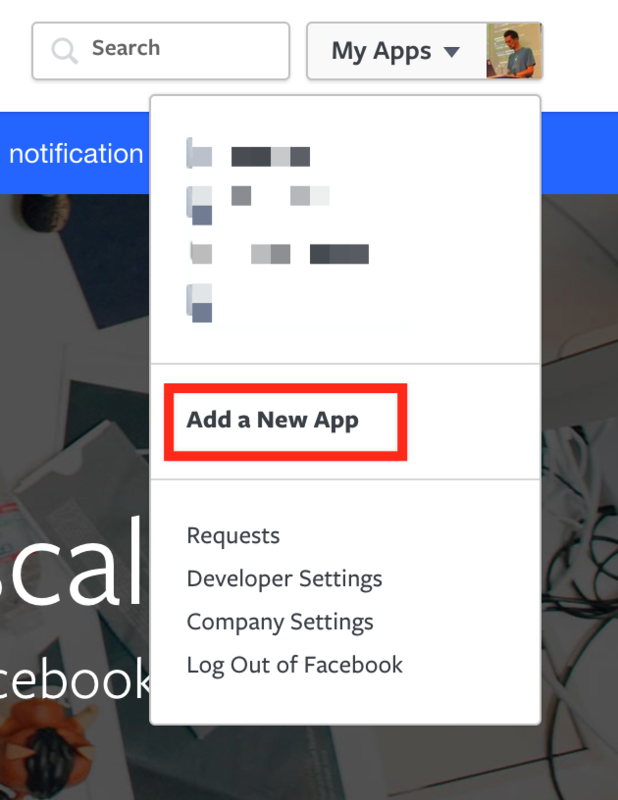 At first we need to add a Facebook login button to our application and the corresponding method in our component. That’s it for now. Next is implementing the mobile Cordova plugin. For using the Facebook login also on your mobile device, you need to add a Facebook Cordova plugin. First you need to add, if you haven’t already, a mobile platform e.g. ionic cordova platform add android. 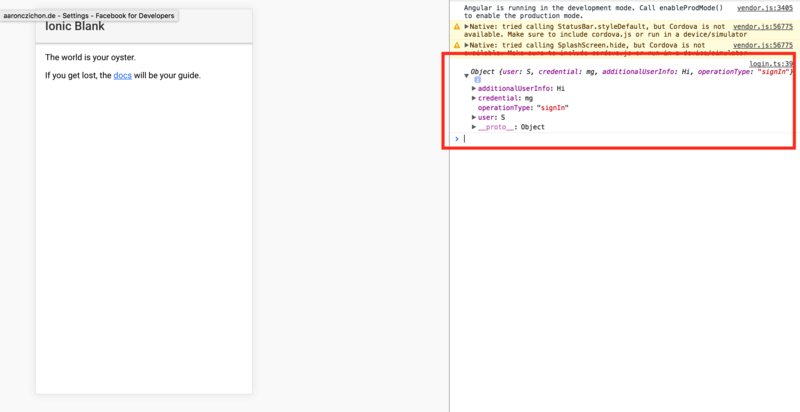 ionic cordova plugin add cordova-plugin-facebook4 --variable APP_ID="123456789" --variable APP_NAME="myApplication" --save. 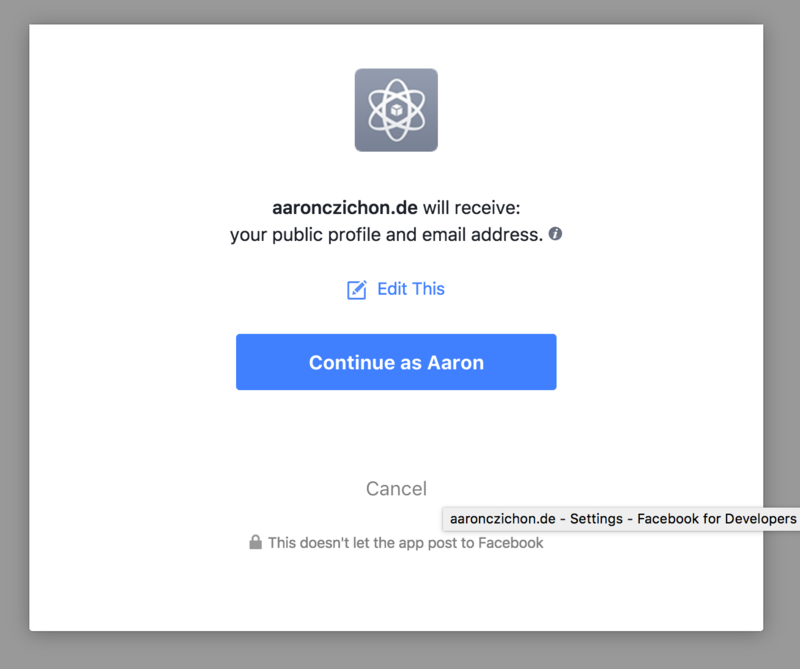 ionic cordova plugin add cordova-plugin-facebook4 --variable APP_ID="1383067751814949" --variable APP_NAME="aaronczichon.de" --save. For implementing this usage now, we switching to our login.ts and importing the Facebook provider and the Platform from ionic-angular package. That’s for the coding part. One last thing is now left. 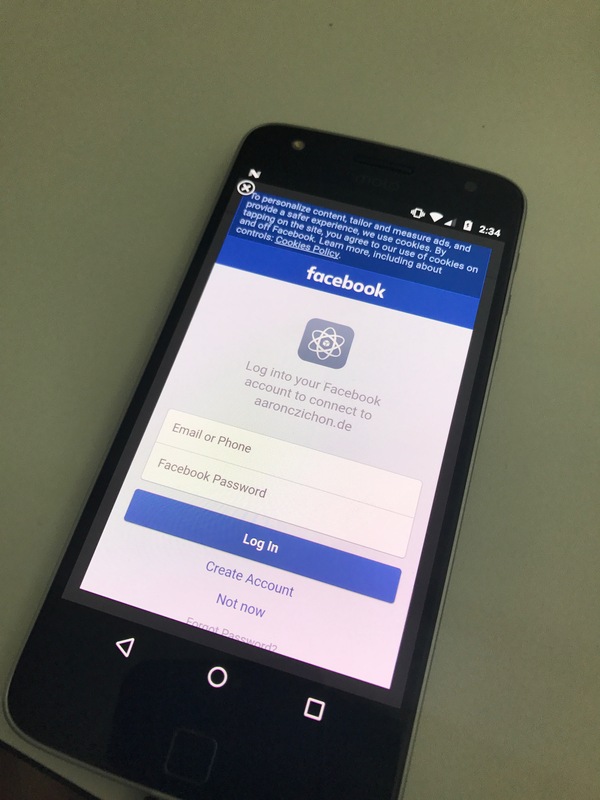 For using the Facebook Cordova plugin we need to switch to the Facebook Developer Portal and enable the corresponding login platform (in our case Android). So, switch to the Portal, select Facebook Login and Quickstart. There you should select the platform Android. In Download the Facebook SDK for Android click on Next. Also click Next for Import the Facebook SDK. Now, in Tell Us about Your Android Project enter your package name (could be found in config.xml as id). E.g. com.webatlas.aaronczichon. Hint: If your app has spaces in it’s name just remove them for the Default Activity Class Name. Hint: If Facebook is asking you, that they have a problem verifying the package name with Google just click Use this package name. Hint: If you enable the iOS platform, click Next on the first two steps and on 3. Add your Bundle identifier enter the same package name which you can find in config.xml as id. And last but not least we have to enable our Facebook application. 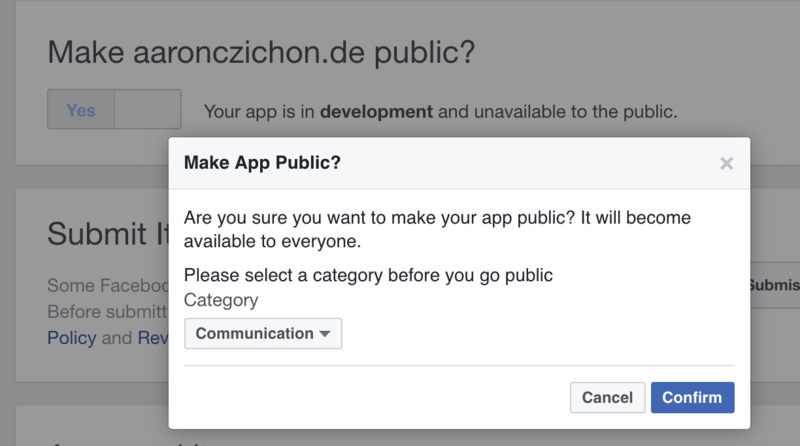 For this go to your Facebook app, App Review and set Make aaronczichon.de public? (but with your app name) to Yes. Choose a category and select Confirm. That’s it! You have successfully added Facebook Login to your application! Connect your testing device and run the application on your device using ionic cordova run android. 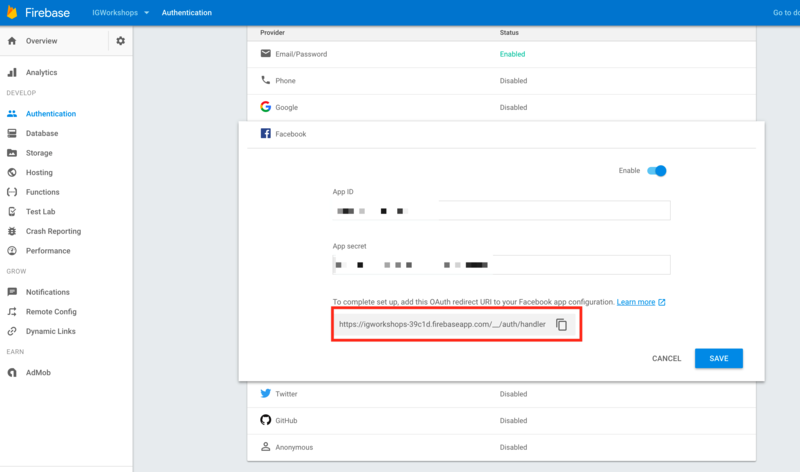 We now have an Ionic application which can use Firebase email and password or Facebook as authentication provider. All users (also Facebook users) will now be available inside Firebase. Because we implemented both, Cordova mobile plugin and the web platform we can run our application on mobile devices (iOS, Android and Windows) and also, for example, as Progressive Web App. The full sample project can be found here on Github.